Airports have fascinated Lauren O'Neill all her life. One day, thinking how they would look from above, she decided to go to Google maps and find out. She came across these amazing pictures and made a selection called Holding Patterns. I've been fascinated by airports for as long as I can remember — there's something about the comings + goings, the organization + operation … ultimately the systems of design at play … that's so intriguing to me. Whether DCA, JFK, or the little municipal airport, I've always lived in a direct flight pattern of an airport. Day-to-day, I glance out my window and watch planes circle about waiting to land. She named the pictures after the airport codes that belong to each of them. During layovers, I often find myself observing the activity on the runway and thinking that I'd love to see this from above. With a creative block on a project, I took to google mapping airports and was enamored by the beautiful satellite shots on my screen. Since then, wanderlust has often inspired me to get lost in the satellite imagery of various destinations even when I'm glued to my desk. So, that's not exactly a 'holding pattern' you say … You're right, but I love the idea of circling above an airport waiting to land. I feel like that mirrors my process of searching for + cropping the right shot. 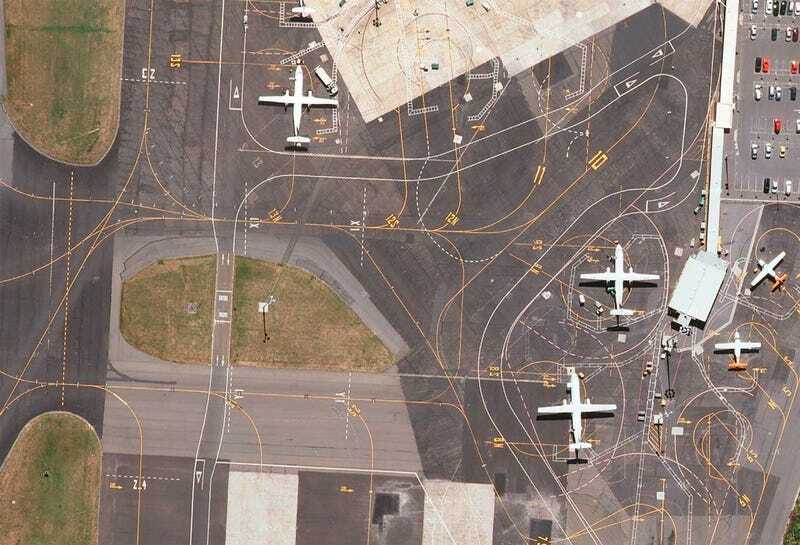 Plus, I love the fact that a lot of the taxiway markings and linework are patterned across an airport's tarmac. You can visit Lauren's website here.